We collect your personal information to provide better services to our Sites users and customers – from providing, maintaining, protecting and improving our Sites, to providing you with product information and promotions and in connection with your placing and our processing any orders for our services. In addition, all customers or visitors to our Sites have the option to register for our newsletter and special offers subscription (referred to in this paragraph as our “Newsletter”) by entering their e-mail address along with their first and last name. Upon completing your Newsletter subscription, You consent to our occasionally informing you about our special hosting offers and company news by way of e-mail to your subscribed email address. If you no longer wish to receive our newsletters or special offers e-mails, you can unsubscribe at any time by using the link ‘unsubscribe’ on the newsletter or special offer e-mail. After receiving the unsubscribe request, we will delete your email address from the distribution list, thus preventing you from receiving any further newsletters or special offer e-mails from us. 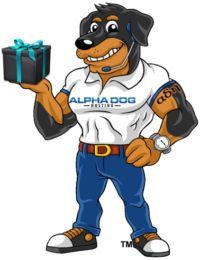 AlphaDog Hosting uses personal information of visitors to our Sites in order to respond to your requests or, if you subscribed to our Newsletter, to send you our newsletter and special offer e-mails. AlphaDog Hosting reserves the right to co-operate fully with local, provincial, state, and federal officials in any investigation relating to any personal information (including private electronic communications transmitted on the Sites) or any purported unlawful activities. AlphaDog Hosting makes all commercially reasonable efforts to ensure that personal information collected from you is protected against loss and unauthorized access. Personal information is collected and stored in a secure manner as required by AlphaDog Hosting. If you are a AlphaDog Hosting customer, you can make changes to your personal information on file with us through the client zone/support portal. If you are not a customer, you can request changes to your personal information or that your personal information be removed from our and our agents databases by sending an e-mail detailing your request to sales@alphadoghosting.com.